Rewritable ID cards work great for applications where a cardholder�s data changes often, or for re-using already printed ID cards. Rewritable ID cards can be updated as frequently as desired, up to 500 times, making it possible to re-issue them to new cardholders once they have been rewritten. Rewritable technology eliminates the costs incurred by traditional ID card printing, which require the use of brand new ID cards and printer ribbons. The revolutionary rewritable ID card printing technology requires no ribbons, translating into valuable savings for your organization! Rewritable ID card printing is also an eco-friendly approach as there is no need to throw away used ID cards every time they need to be updated. 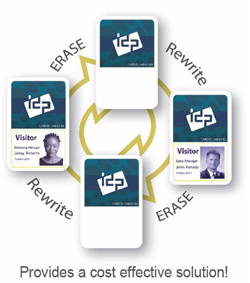 With Rewritable Technology, simply erase and reprint the same ID cards over and over! Rewritable ID cards are perfect for making Loyalty ID Cards, as you can update the status of a customer's loyalty points and add personalized promotions as well as special offers directly to the customer's ID card. They are also great for reprinting Visitor ID Badges, which are often only used once. Simply rewrite them with the new user name, company name and visit date. For Holiday and Ski Resorts re-use ID badges that are reprinted with new name, photo, barcode and date valid, and use the same Student ID Card for a student's entire enrollment at a school! Cost-effective, no ribbon purchase necessary and cards can be reused up to 500 times. Cutting-edge marketing tool enhances performance of multilevel marketing programs, and latest promotional offers can be printed on plastic ID cards in a snap. Quick update feature, data can be edited on the spot, whenever needed. Multiple applications, suitable for magnetic stripe and contactless applications.